April 8, 10am-noon, Coffee Hour – join us for a cup of coffee or tea, a sweet or two and good conversation. Suitable for all ages! April 13, 5:00 pm, Friends of Peacham Library – Join FOPL in their support of the library! April 15, 10am-noon, Coffee Hour – join us for a cup of coffee or tea, a sweet or two and good conversation. Suitable for all ages! April 21, 7:00 pm, Readers’ Delight – The Invention of Hugo Cabret by Brian Selznick is this month’s book. Contact the library if you would like to borrow a copy of the book. Hand-drawn note cards for sale! Scott Sauter has created some amazing note cards that are available to purchase at the library. 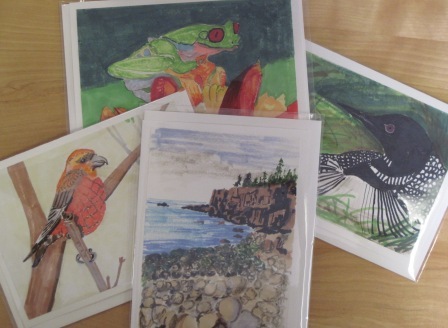 Each hand-drawn card comes with an envelope and sells for $5 with all proceeds benefiting Peacham Library. Renovations are right on schedule — the radiant heat tubes have been placed, the cement poured and the framing is about to start. Follow our Facebook page for daily updates. No need to login, our page is open to everyone. Want to be part of the process? Use Amazon Smile (or use the link to the right) when purchasing items from Amazon and we’ll get 0.5% as a donation from Amazon. Want to give more? Make a donation directly to the library — either through PayPal or directly to the library. Thank you all for your support! Flea Market! Do you have any quality, used items you wish gone from you house? 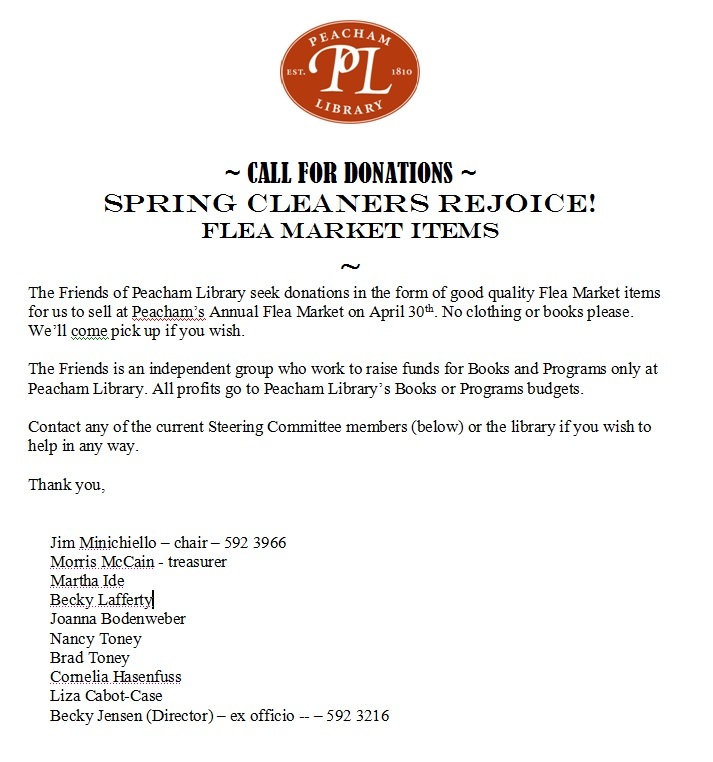 Why not give them to Friends of Peacham Library for the Flea Market on April 30?